You will see here a few examples of traps in the opening. They are the best argument that in chess, you always have to pay attention to what happens, otherwise you may lose the game when you least expect. You will see here that there are a great number of possibilities even at the beginning of the game. I will only show you a limited number of this positions (only the most common). Scholar's Mate 1. e2-e4 e7-e5 2. Bf1-c4 Bf8-c5 Nothing special until now. 3. Qd1-h5 Closes in for the kill! 3... Ng8-f6?? This is a very bad move. This doesn't help Black at all. The right move is 3... Qd8-e7 to protect the f7 square or 3... g7-g6 to block to queen's path. But since none of those moves were done the queen has no problem and : 4. Qh5-f7 . 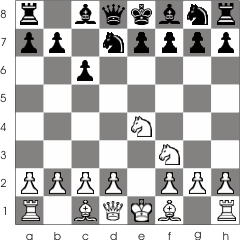 There are several ways this technique can be applied : using a knight instead of a bishop, moving the queen at f3 instead of h5 and so on.. Black can use this technique as well. 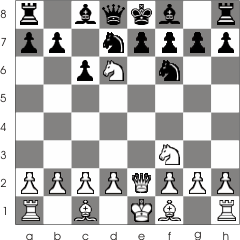 Fool's Mate This is the worst possible combinations of moves White can do! 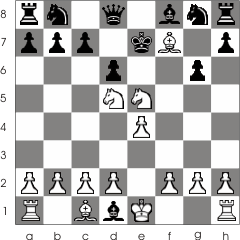 1. f2-f3 e7-e5 2. g2-g4 And with this, White manages to completely remove his king's defense! Black takes advantage of this and: 2... Qd8-h4 Black wins! This is sometimes called Fool's mate; you might guess why that is! Legal Mate This checkmate is famous. The game was played in 1750 at Paris between the Legal and the Saint-Brie knight. The opening is called Philidor Defense. 1. e2-e4 e7-e5 2. Ng1-f3 d7-d6 3. Bf1-c4 Bc8-g4 4. Nb1-c3 g7-g6 5. 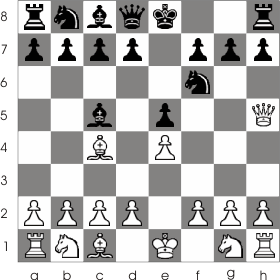 Nf3:e5 White sacrifices the queen! Black doesn't understand the consequences of what he is about to do and captures the queen! 5... Bg4:d1 After this the mate will immediately occur! 6. 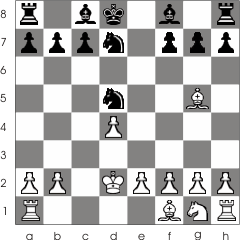 Bc4:f7+ Ke8-e7 7. Nc3-d5! Checkmate! A very interesting game 1. e2-e4 e7-e5 2. Ng1-f3 Nb8-c6 3. Bf1-c4 Nc6-d4 There are many ways White can react to this move. But this move hides a trap: if White captures the pawn at e5 instead of developing his pieces or exchanging the knight at d4, then he will have a surprise! 4. Nf3:e5? 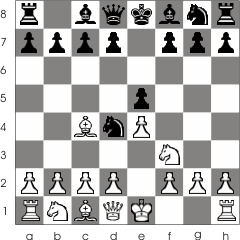 Qd8-g5 Now the queen has a simultaneous attack over the knight at e5 and the pawn from g2. 5. Ne5:f7 With this he attacks both the rook at h8 and the queen. But now Black puts in action his surprise : 5... Qg5:g2 6. Rh1-f1 Qg2:e4+ 7. Bc4-e2 Nd4-f3 And White is checkmate in a beautiful manner with etouffe mate! 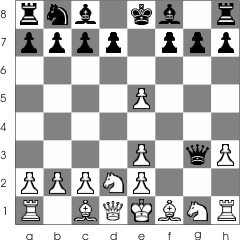 As you can see, White has several occasions to avoid checkmate, but doesn't take advantage of them due to the fact that the end result is hard to spot. 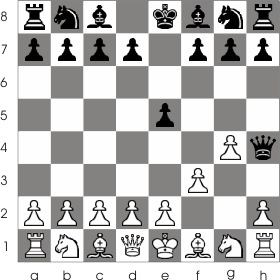 For example, White can move the queen in front of the king instead of moving the bishop 7. Qd1-e2. But by loosing his queen 7... Nd4:e2 and having a week position White doesn't really stand a chance. Of course, if Black is a beginner in chess, than White might still go on playing, hoping his opponent will make a mistake. 17th century from the Greco collection. 1. d2-d4 Ng8-f6 2. 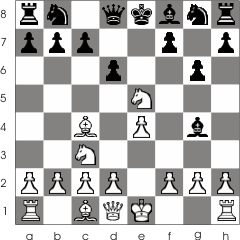 Nb1-d2 e7-e5 3. d4:e5 Nf6-g4 4. h2-h3 As you can see White made many mistakes. 4... Ng4-e3 ! 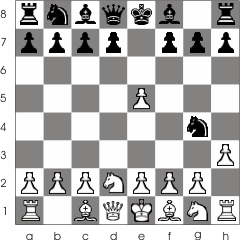 White is forced to do the following move otherwise he loses the queen. 5. f2:e3 Qd8-h4+ And now, of course 6. g2-g3 Qh4:g3! White is now checkmated. 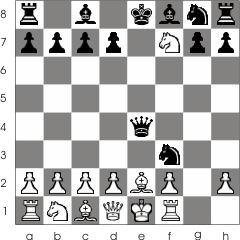 The fact that White made some mistakes allowed his opponent to make his ingenious moves. A game played at the 1982 Olympics This game was played between Nisimura (White) and Marco(Black) 1. e2-e4 c7-c6 2. Ng1-f3 d7-d5 3. Nb1-c3 d5:e4 4. 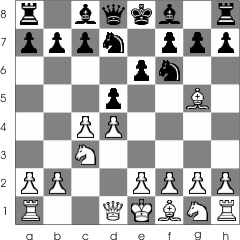 Nc3:e4 Nb8-d7 Until now all the moves are specific to the Caro-Kann defense. 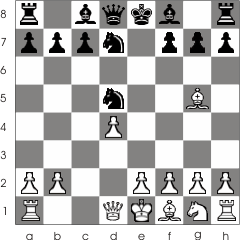 The next move, however, is not the usual one for this opening; as you may guess it hides a trap! 5. Qd1-e2 Ng8-f6? Black makes the mistake White was expecting. 6. Ne4-d6 A beautiful etouffe mate!